Twitter Poll: What is Leadership? 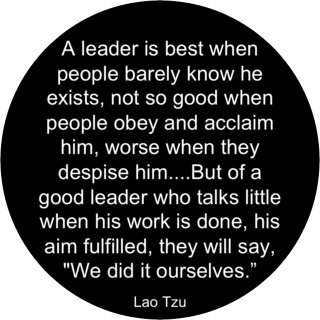 I’ve been curious lately about what leadership means… or about what people think leadership means these days. Specifically in terms of the new world of work, of self-organizing systems, of self-interested autonomous agents collaborating towards common goals. What are the traits and characteristics of authentic leaders? How does their behavior influence/inspire others? I sent out a tweet yesterday to see what you had to say on the topic. Thanks to all who responded! @arfisk – It depends on circumstances. Look up ‘Situational Leadership’. @leashless – Leadership is sitting on the irritating weasels that make cooperation impossible. Competitveness suppression in groups, too. @md_wallace – seting an example, trusting intuition for dir, self-faith to lead ppl thru adaptive challenges despite reactive behaviour. @GuidoStevens – Leadership is unlocking the path to a better future. @harlantwood – leadership is creating the topology of gravity wells for others to dance in and express their particular gifts and genius. @michmccarthy – ldrshp is a commitment to increasing personal/team effectiveness, going first, and asking for help to lead new ideas/results. @kimberleydaly – Leadership is knowing how to put those around in places tht encourage growth for org and them. Listening to others w/o ego. @giyom – leadership = the gravitational effect of a group’s embodied intentions & potential. Incr.ly emergent, transient & collective. @foundy17 – to quote Napoleon, ‘A leader is a dealer in hope’. One assumes the hope relates to us ‘plebs’ managing to pull it off! @SMByersOlympia – a leader convenes people talk about what they would really rather not talk about…adaptive challenges. @dgriffinxl – Leadership is: First into battle, last in retreat. – Hence many are called, but few are chosen. @davemacboston – Leadership is the marriage of conviction and humility. Seeing what others may not, taking initiative, setting examples, big heart for people who do not get it yet. We’ve all been there. ditto on “undefining leadership”- also the definition leadership power is to em-power.